Here's all the recipes listed under Experimental Quiche along with the comments posted by the breakfast lovers that submitted them. "Leftover Indian food for breakfast? You bet. 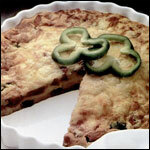 This quiche has a lot of ingredients and takes some effort to prepare, but the results worth it." "This is SO easy - and a great way to get rid of leftovers. The dip makes the quiche extra smooth and creamy too!" "Okay, this quiche is basically pumkin pie for holiday brunch. But it's fun and delicious... especially with a little whipped cream." "Classic recipe from a 1984 magazine ad... "an unbelievably delicious Spam recipe... Speedy Quiche... It just might surprise you."" "I found myself yodeling while putting this concoction together. The Swiss cheese really puts the taste over the top in this quiche. Enjoy! We certainly did."